You want to run a 5K, a 10K, a half-marathon or a marathon. But you don’t know how, how much and how often you should train. 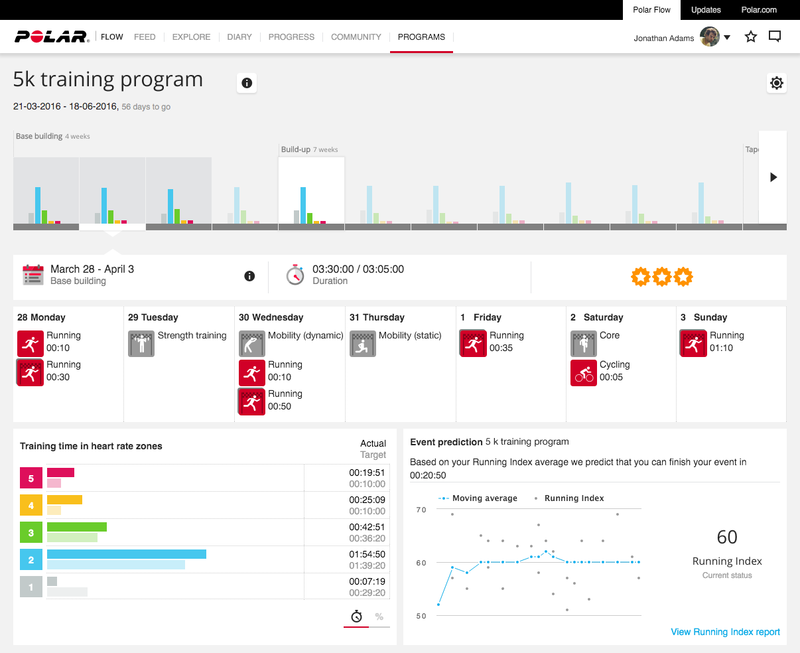 Enter Polar Running Program – a free running plan that you can set up on the Polar Flow web service. It is personal and easy to use and guides your training, making sure you’re in top condition come race day. So, sit back, make yourself a protein shake and we’ll walk you through the basics. If you’re more of a sprinter, click the video below to get a quick overview. The Running Program is a running plan made for your personal needs. Choose your target from four different distances – 5K, 10K, half-marathon and marathon – and then specify the date when you’d like to run that distance. Running Program is a running plan made just for you and your needs. 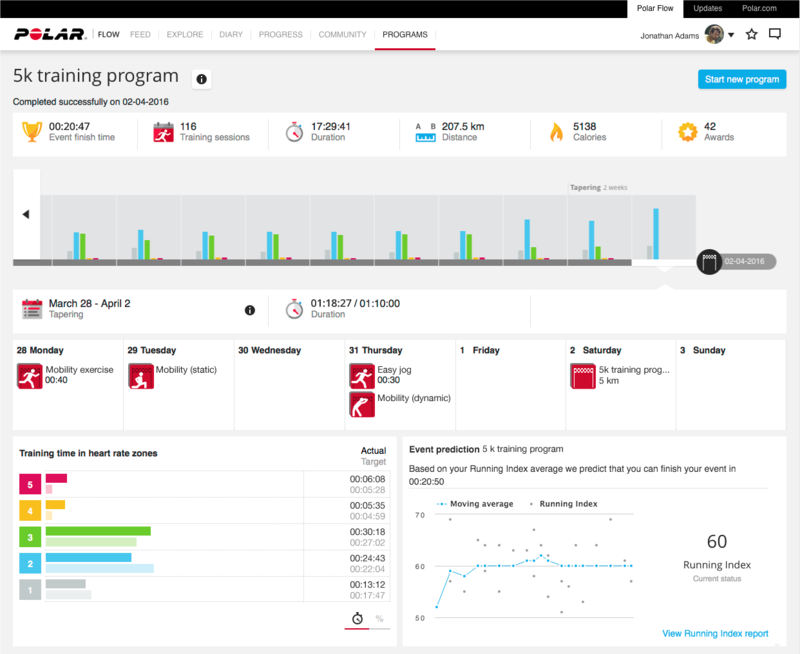 The Running Program looks at your training history (if you’ve logged enough training on Polar Flow), gauges your current activity level and prepares a personal running program (including supportive exercises, like strength and mobility) for you in seconds. 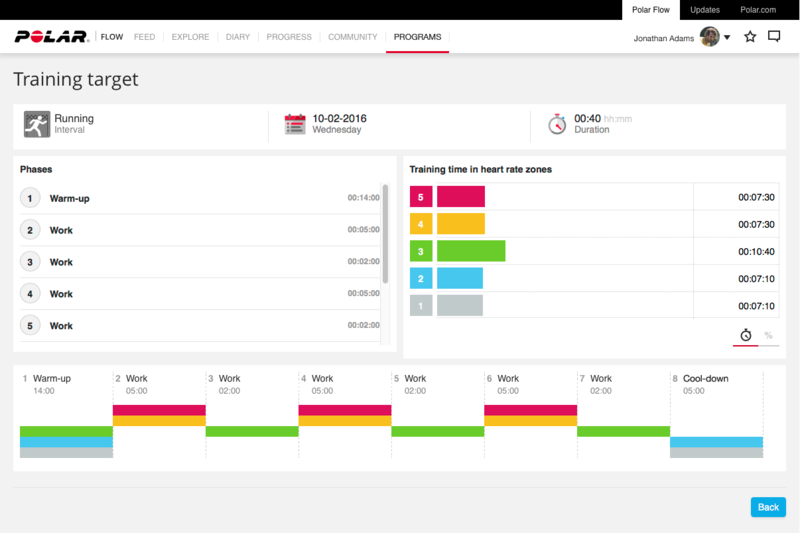 Once ready, the plan is available on Polar Flow, the online window to your activity and training, available as a web service and as an app for Android and iOS. 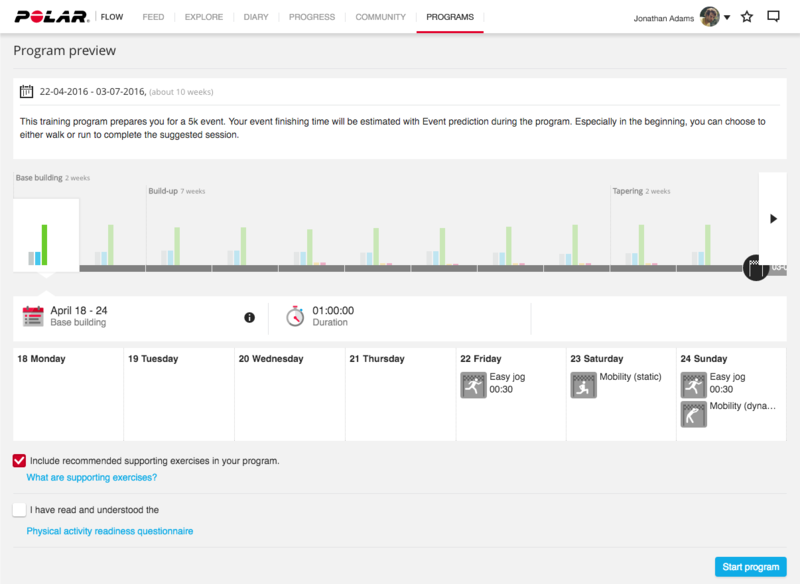 Running program: How long is the training plan? Let’s say that you’re training for a half marathon that’s six months away. Good. You’ll have plenty of time to get started with the Running Program. The minimum duration for the running training plan is 9 weeks for 5K, 10 weeks for 10K, and 14 weeks for a half-marathon and marathon. 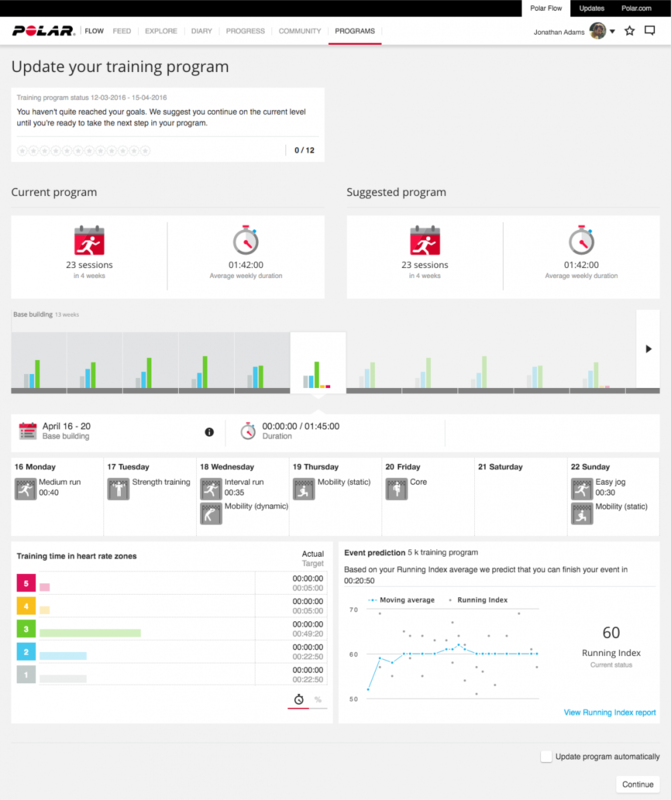 The Running Program uses your training history and your self-evaluation to determine what your training plan should include. If your target is unrealistic, the program will let you know. Play around with these two values, your target event and your target date, to get a feel of what your training plan will be like. If you’re a new Polar Flow user with no training history, answer the self-evaluation questions to get a plan that fits your activity level. This phase refers to what happens before the actual running program starts. Like the name suggests, this is when you lay the foundation for more advanced training. You can start the base building phase months before you plan to run your event. The base building phase is made up of four-week cycles: three weeks of progressive training and then one week of lighter training. After each four-week cycle, the Running Program gives you a suggestion as to whether you should continue on the same level or make changes to your training. In the end, it’s you who decides. This phase lasts 9–15 weeks, depending on your target distance. You’ll go through two weeks of training that get progressively harder. Then, it’s time for a week of lighter training. The build up phase is a predetermined set of running workouts that are designed to help you reach your top condition. This is the period leading up to your big moment. You shouldn’t train too hard during the tapering phase, so the Running Program will scale back the volume of your training. If this is your first time training for a running event, chances are that your training is too one-sided. If you’re always running the same 2.7 mile stretch at the same pace, you’ll get better at exactly that: running that 2.7 mile stretch at the same pace. The Running Program gives you five different running workouts. 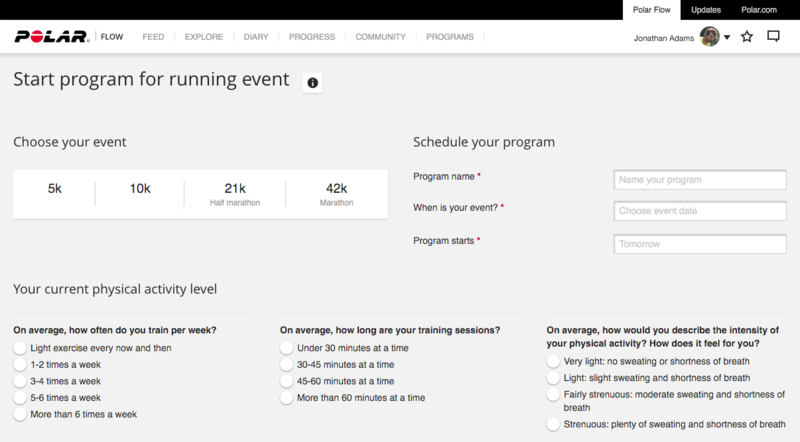 The Running Program gives you five different running workouts that you can do before the event day. These running workouts will add variety to your training and boost your performance faster than repetitive training. Each running workout in the Running Program consists of these elements: workout type, duration, phases and training time in specific heart rate zones. Each of the five workout types has a different target and each workout includes a warm-up and a cool-down. An interval training session might include, for example, 8 phases and last for 40 minutes. First, you’ll warm up for 14 minutes in heart rate zones 1–3. Then, you’ll do six repeats, alternating between hard and moderate repeats. The eighth phase is the 5-minute cool-down. The Running Program goes beyond a running training plan. Improve your core strength, muscle strength and mobility. It includes guided supportive exercises you can do at home or on the go. Just follow along the tutorial videos that guide you through the exercises step by step. The videos are available on the Polar Flow web service and in the Polar Flow app, so you can do them whenever and wherever. The exercises address common problems faced by runners and improve your core and muscle strength and mobility. By doing the exercises, you complement your running workouts and reduce the risk of injury. But to make the most out of the Running Program, you should consider using a Polar GPS sports watch, such as Polar M430, Polar V800, Polar Vantage M, Polar Vantage V. These GPS sport watches measure your heart rate and let you set your training targets. The Running Program is based on training in the right heart rate zone so if you don’t have a way to measure your heart rate while on the run, it defeats the whole purpose of the program. Also, Polar M200, Polar M430 and Polar V800 have been designed for runners so you get plenty of nifty features that’ll guide your training and give you feedback about your progress. The Polar Vantage series multisport watches aren’t designed only for running but are ideal for that, too (with a variety of multisport features to support a wide range of sports). To boil it down, here are two main reasons why Polar M430 is a good match with the Running Program. After you sync your running plan from Polar Flow to you sports watch, you can start a training session straight from the Diary view on your watch. If you’re doing the interval training session we dissected above, your Polar M430 will guide you through the training once you choose that training session and press start. Your Polar sports watch will tell you what to do and when. It’s like your running coach at the side of the track. Training for a running event is bigger than any individual training session. The Polar M430 tracks all the different sports you do. Say, you go cycling instead of running. No worries! Tracked. In addition to being your track-side coach, Polar M430 is your long-term training partner and advisor that tracks all your training so that the Running Program can suggest adjustments to your running plan on the go. And if you’re curious about what finish time you could aim for, take a look at the Running Index report on Polar Flow, visible at the bottom right. It estimates your finish times for different events, such as a half marathon. This is what we mean when we say the Running Program is adaptive and personal.  The Polar Running Program is free. It’s motivating. It’s easy to use. Check out this in-depth guide. Or read more about how to get started with the Running Program or watch the Get started with Running Program video.